Twelve years before boxer Jack Johnson and fifty years before baseball player Jackie Robinson, Taylor faced racism at nearly every turn—especially by whites who feared he would disprove their stereotypes of blacks. In The World’s Fastest Man, years in the writing, investigative journalist Michael Kranish reveals new information about Major Taylor based on a rare interview with his daughter and other never-before-uncovered details from Taylor’s life. Kranish shows how Taylor indeed became a world champion, traveled the world, was the toast of Paris, and was one of the most chronicled black men of his day. From a moment in time just before the arrival of the automobile when bicycles were king, the populace was booming with immigrants, and enormous societal changes were about to take place, The World’s Fastest Man shines a light on a dramatic moment in American history—the gateway to the twentieth century. “In this original, surprising, and important new book, Michael Kranish brings a man and an era back to vivid life. 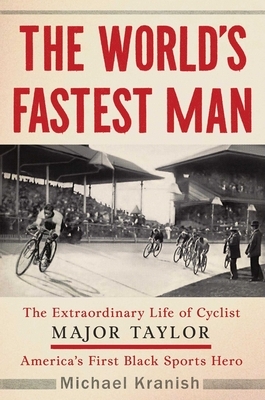 The story of Major Taylor—sportsman, bicyclist, pioneer—is in many ways the story of America. Through his speed and his grace, Taylor emerged as a critical figure that showed a world dominated by Jim Crow and abhorrent theories of innate racial disparities that the prevailing climate of opinion was as wrong as it could be.” —Jon Meacham, winner of the Pulitzer Prize and author of The Soul of America: The Battle for Our Better Angels.